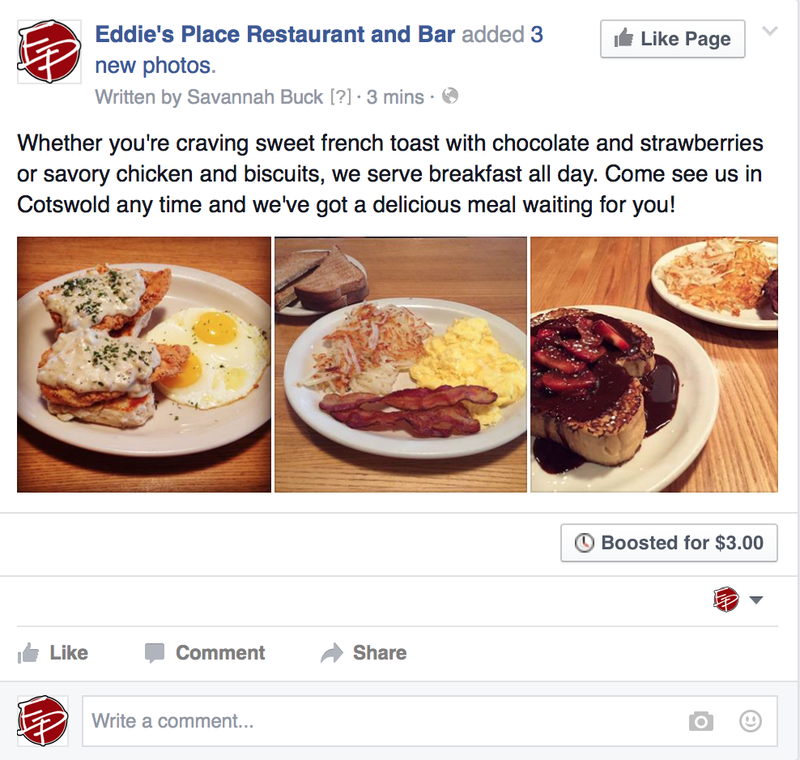 Boosting Facebook posts is great and affordable way to promote your business. With a minimum of only $1 a day and the option to target who you want your posts to reach, you can deliver your content to your demographic choice at an amazing price. 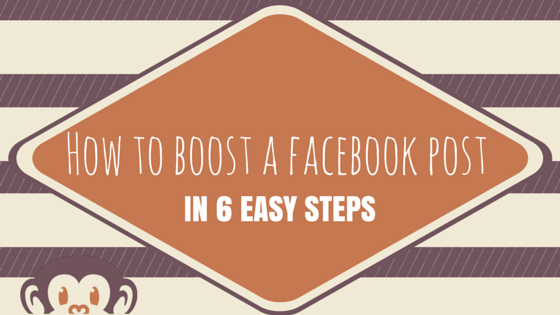 In this blog, the process of boosting a Facebook post is shown in 6 easy steps so you can start advertising via social media! 1. Post the content that you want to boost. 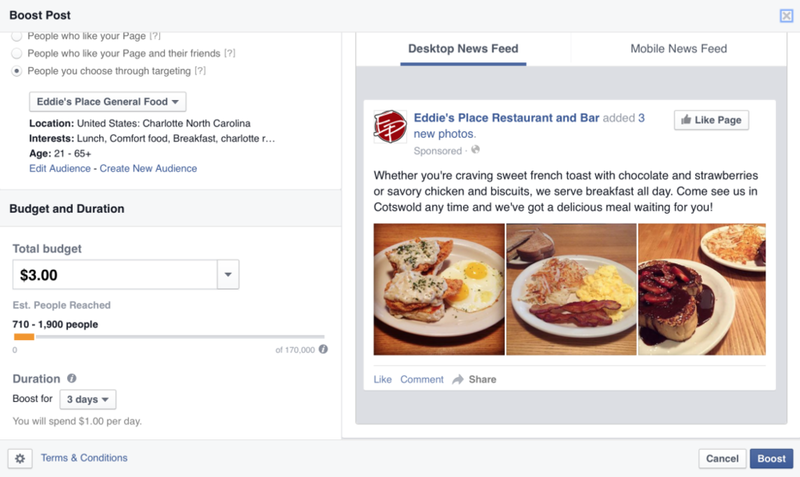 At the bottom right corner of your post, you will see “Boost Post”. 2. After you press “Boost Post”, this box will show up on your screen. You will see your post on the right and a list of options on the left. You will then want to determine your audience. You have the choice between people who like your page, people who like your page and their friends, and people you choose through targeting. Depending on your content, you can decide which option would be best. 3. If you choose to advertise to people through targeting, you will need to press “create a new audience". When you press that button, this box will show up on your screen. You can choose multiple locations by typing them in. If your content or the place you’re advertising provides alcohol, you want to make sure your age range starts at 21. From there you can choose gender and interests. Be careful with putting too many interests because this could narrow your reach by being too specific! 4. After you save your audience, you want to choose your budget and how many days you plan to have your post boosted. 5. Once you are done when all those details, look over the post again and all the details of your boost and press “Boost” at the bottom right. You will put your credit card information the first time you boost, but after the first boost it will auto save your card. 6. Your post is boosted and ready to be seen! As time passes, you can see how much reach you have and how much money is left in the boost at the bottom of your post.